Maybe it’s a holiday you have been planning for some time and the narcissist knows just how much you have been looking forward to the break. Maybe it’s a reunion for your closest friends or a special birthday party. Whatever the occasion, the narcissist will do their utmost to make sure that it doesn’t turn out to be as special as you had hoped. They want you to share in their own misery. They don’t like to see others happy unless of course, they are the cause of such happiness. Happiness seems so alien to them. Why should you experience joy when they rarely feel fulfilled? Why should they have to put up with being in the company of your friends or family? They are simply jealous of your close friends or the close relationship you have with members of your own family. They know that they haven’t and never will have that close bond with anyone. If the celebration is a birthday party or graduation celebration, they don’t want someone else receiving all the attention that should be directed towards them. Perhaps if they look dejected, everyone will feel sorry for them and turn their attention where it belongs. The narcissist will do anything in their power to sabotage the occasion. As your holiday fast approaches, don’t be surprised if the narcissist picks a fight with you, and cancels the holiday at the last minute. They may have just found your replacement. Should you find yourself on holiday with a toxic person, and you are doing your best to make the most of your time, they are going to hate to see you enjoying life. They will go all out to ensure that the holiday will go downhill from there on. They will make a condescending remark just to dampen your spirits, or provoke an argument, basically anything to bring your mood down to a similar level as their own. Whilst on holiday, you may be directing all your attention on making sure the kids have fun. Isn’t that what normal parents do? Don’t forget this person is far from normal. They want your attention, so they may resort to huffing and bad behaviour to get it. Any attention is better than none. You want the narcissist to enjoy the holiday or special event, so you try your very best to draw them out of their mood, but no matter how hard you try, nothing seems to work. You feel like they are making you suffer for your efforts to make them smile and be happy. It is like they see you as an enemy, and certainly treat you like one. Only a sick and twisted individual would get some sort of pleasure from ruining holidays and other important events. 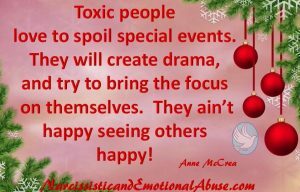 What can you do to avoid the narcissist spoiling special events? Remember that if you are having a good day the narcissist will do anything to spoil it. They want to make the day memorable for all the wrong reasons. Don’t give them the opportunity. Let them be miserable, let them drown in their pool of negativity and self-pity. Carry on and leave them to it. Enjoy yourself and let them be. If they happen to come off with some disparaging remark, just respond with something like, ‘Fascinating,’ or ‘Interesting,’ and go and do your own thing and above all, enjoy the occasion. Now that Christmas time is upon us, there is of course the chance that the narcissist will do all in their power to make it a memorable one. They may decide not to show up. Great! There will be more for everyone else. If however, they decide to grace you with their presence, there just may be a silver lining. If things don’t go to plan, the turkey is overcooked and the narcissist is so busy doing everything in their box of tricks to be the centre of attention, who is ever going to notice if the turkey isn’t perfect? Should I return the gifts? Yep! This is my husband to a tee. My birthday, his birthday , now Christmas eve……all ruined. If he can puff his chest about himself…all is good. Otherwise get ready for a shitload of abusive behavior. Unfounded verbal abuse. I am learning that my husband is a narc. Know the feeling. How do you handle it? I can’t take it anymore. Me too, I am beside myself after both myself and 5 kids were treated today. He spoils every special occasion. My partner of 7 horrific years is 100% narc not one hood memory to recall strangle addicted to being ground down I no longer find him tolerable. Jelous of my children from previous (domesticviolence)relationship from which he claims to of saved me from…he has done the most unimaginable unforgivable damaging things to me then labelled me a discracful mother for them seeing me in ruins. There should be a sentence for these villains. Calculated and callus for such small minds is so unbelievable. I never thought he had the intelligence to plan his behaviour. Iv just left my husband 19 months ago after experiencing this behaviour for 13 years from he’s mum and sister also !! Now there mulipalateing social services now ! To force the children to see him against their wishes. Why oh why they get away with it he’s got away with Domestic violence and hurting he’s kids and pets also . They should be held accountable for their abuse they dish out !! My monster-in-law let me watch everyone she had invited to her house for Christmas open tons of gifts – gifts for everyone galore- and I got zip. My little 3-year-old kept saying: “Open your present Mommy!” and finally I just had to tell her – mommy doesn’t have a present to open. What kind of person does that? Thank you so much, I didn’t realise what was wrong with my Ex. Now I do. It has taken over 30 years. Please get out at the first sign of narcissistic behaviour. It wasn’t me! I tried so hard to make him happy. Nothing worked and now I know it never would have. I have wasted 30 years of my life on this scum bag. One good thing is, I have 3 beautiful children, If it was not for my daughter who called the police that night, I may not be writing this now. Yes, I am still scared of him. I do have an order in place for 12 months. I am so scared of my life now, as I live in a shadow of thinking I am not good enough, pretty enough, skinny enough. I am nearly 60 what do I do now? I feel I do not know myself, what will happen to me, he has taken my life from me and I have to take it back some how. I really don’t know where to start. I feel lost. Find Leslie Berg Vernick online or read any of her books. You are NOT ALONE. Look for videos by Patrick Doyle. There are so many people in your same situation. Good for you! I, too, have found that no contact with my narc adult son & narc husband have given me back my life, my joy & my freedom! What if the narcissist is the bridesmaid at her sister’s wedding?? If anyone still reads this post, please reply with suggestions because I’m not really seeing any helpful suggestions in the article either. No offense intended! This young woman is about to stand in her sister’s wedding and all the events leading up to it have already been sabotaged. The bride isn’t even looking forward to her own wedding because she knows “what’s coming”….so so sad. From what I’ve read elsewhere and in my own experience, the only way to “enjoy the occasion” would be to uninvite or remove the narcissist. Especially at a wedding.